Has your Emerson E20 InSinkErator or garbage waste disposal unit seized? Is your Emerson E20 garbage gobbler leaking water into your kitchen cupboard? Has your Emerson E20 InSinkErator or food waste disposal unit just stopped? 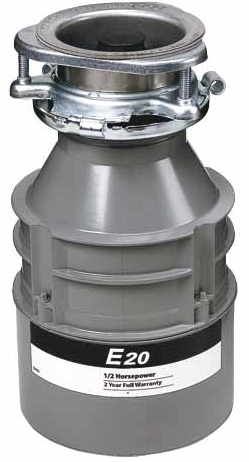 Is your Emerson E20 garbage waste disposal unit noisey when running? We can supply & install a new quality InSinkErator food waste disposal unit to suit your needs. Features & Warranty: 2 year parts and service. • Air switch accessory available & 1-stage grind technology. Every InSinkErator model is compact enough to fit neatly under the sink without taking up valuable storage space. Competitors can't match our quietness of operation or finer grinding capability.